I mentioned in the last post that having 5 kids in kindergarten has added a new layer of crazy to our world. Well….here’s a good example of what I was talking about. The kindergarten teachers sent out an email last week about a new project coming up for our little scholars (first thought: yay! 5 projects to do…so completely what we were hoping for!). The kids are learning about rhyming words and being introduced to poetry through the use of nursery rhymes. To make it memorable and fun (of course – fun – this is kindergarten – everything must be fun!) the kids are all going to pick out a nursery rhyme that they will present to the class on a tri-fold presentation board (which is thankfully being done at school and not at home!). And here’s where the fun comes in – the kids are going to dress up like one of the characters in the nursery rhyme! We get to figure out the what and the how of 5 nursery rhyme costumes….yay us! So yeah…there’s that. But here’s where the story gets funny. Ryan picked “Twinkle, Twinkle Little Star” as her nursery rhyme. Easy enough right? Dress her in black, sew or pin some stars to her and we’re good. Right? Well, Ryan had other ideas. She told Casey that she wanted a star costume – she wants to be a star. Not several stars on a black shirt; a single star with her arms and legs as the points of the star. Casey just kind of gave her the ol’ non-committal “uh-huh” that parents know so well and sent Ryan back to play. 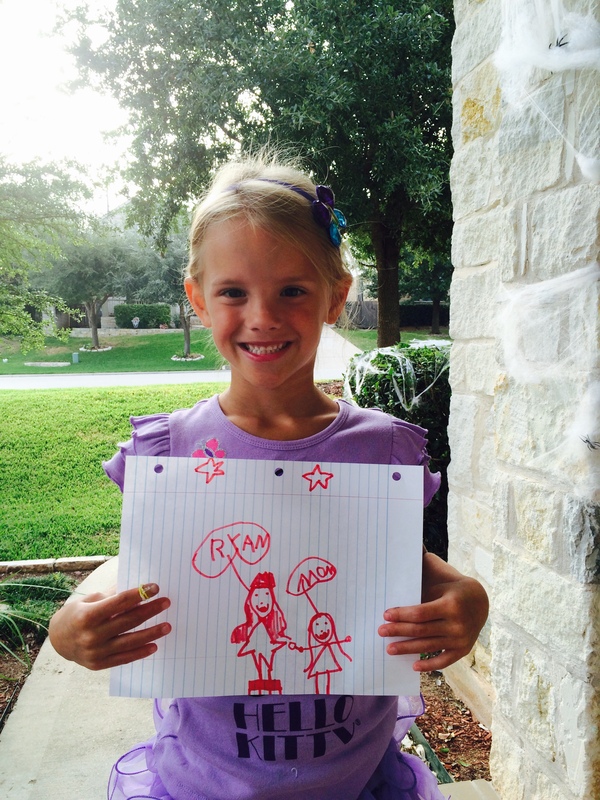 But Ryan didn’t go back to play – she went to the drawing board to draw a picture. She drew the picture you see above. Yes, that’s Ryan on the pedestal with her star costume being sewn by her maid-servant, aka Casey Ann. No pressure, mama…you got this! Umm, yeah……. The other kids haven’t yet provided us with vignettes of their costumes, but I’m sure they’ll get to it soon. Here is what they’ll be dressing up as: Brooklyn is doing Baa Baa Black Sheep; Britton and Lila are both Jill from Jack ‘n’ Jill; and Jack is Peter Peter Pumpkin Eater. Look out fun, here we come! *Just to be clear and hopefully keep people from getting the wrong impression – we love the kids’ kindergarten teachers and know the kids will love this project. Yes, it’s a bit much for us to do 5 costumes, but that’s the way it goes when you have quints – it’s what we signed up for when we told the doctors we would absolutely not consider reducing the pregnancy when we learned Casey had 5 little miracles growing inside of her. It would be absurd for the teachers to change their lesson plans or projects for us and even if they did that, we would not accept the change because it would deprive our 5 from having the fun learning experiences that the other kids in their class would enjoy. So, not complaining (well, maybe a little), just sharing some of the challenges we face in a hopefully fun way. Hope you enjoy! Oh, you never sound as though you are complaining….just showing us the reality of having quints. When my kids were little, I could barely manage ONE costume….my hubs always had to do it…he was more talented at such things. 5 would make me have an attack of some kind. Blessings to your beautiful family. Loved this story! And I love Ethan’s philosophy!